Critics claim that Islam conduces to, or explicitly preaches, extremism and mindless violence. Some radical Islamist movements, that are a product of local circumstances as well as certain international political developments, are undoubtedly engaged in extremism in the name of Islam. This is particularly unfortunate in that it gives Islam a bad image as well as provides ample ammunition to Islam’s critics. Lamentably, Muslim leaders, especially the ulema and other religious figures, are so enraged and offended by this unjustified criticism of Islam that they are simply not ready to admit that radical Islamists are indeed misusing the fair name of Islam to engage in extremism, which is readily apparent across the Muslim world and even elsewhere. It is imperative, however, that serious and committed Muslim scholars and activists critique and condemn the politics of extremism in the name of Islam. What is the best way for them to do so, especially since these radical groups claim to base their ideology, politics, and practice on the Islamic scriptures? What Have We Learned About Interfaith Relations in Africa? Africa is the only continent where Muslims and Christians live together in very large—and roughly equal—numbers. There are about 425 million Christians and 500 million Muslims in Africa. 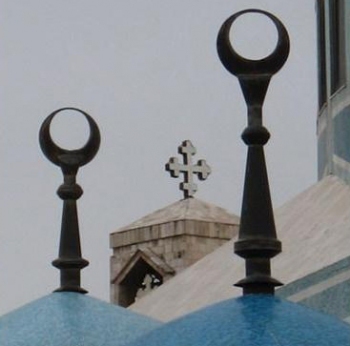 The Muslims are concentrated in the north and the Christians in the south, so the great meeting place is in the middle. The Pew Forum on Religion & Public Life recently did ahuge public opinion survey in this region; we conducted 25,000 face-to-face interviews, using more than 60 languages and dialects, in 19 countries in sub-Saharan Africa. We titled our report “Tolerance and Tension” because, frankly, the survey found a good deal of both. We see tolerance in the fact that sizable majorities in every country say people of different faiths are very free to practice their religion, and most feel that this is “a good thing” rather than “a bad thing.” In most countries, majorities also say it is OK with them if their political leaders are from a different religion than their own. But we see tension in the fact that substantial numbers of people in most of the countries surveyed (including 58 percent of Nigerians and Rwandans) say religious conflict is a “very big” problem in their country. As an Oklahoma City resident who celebrates religious diversity, I was alarmed when I heard about the “I Don’t CAIR” conference sponsored by Reclaiming Oklahoma for Christ and was held at Trinity Baptist Church in Yukon in March. I decided to attend because I was curious. I was a guest at the dinner sponsored by CAIR (Council on American-Islamic Relations) the previous weekend. CAIR is a civil rights organization working to enhance understanding of Islam and to improve relations between Islamic-Americans and people of all faiths in America. It has chapters throughout the U.S., including one in Oklahoma. 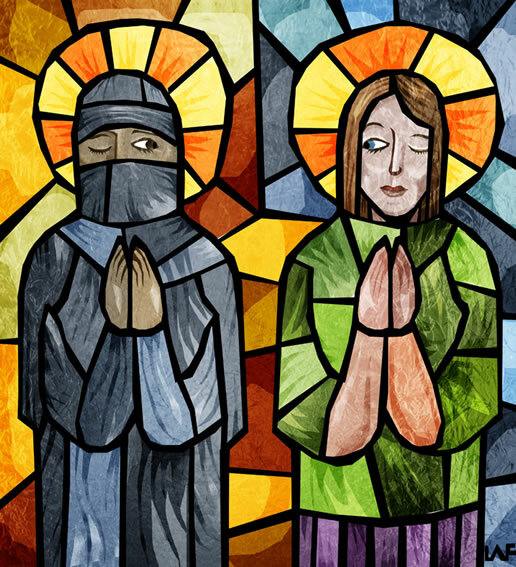 American Muslims and Protestants: Can We Talk? American Protestants need to understand that their American Muslim neighbours do worship the very same God, the God of Abraham, Isaac, Ishmael, Moses, and Jesus. They need to understand that the name, ‘Allah’, is just the Arabic form of the Aramaic ‘Alaha’, which is what Jesus Christ called God. Islam sees itself as the culmination of the Judeo-Christian tradition, and it honours its Prophets and traditions, notes Hesham A. Hassaballa. 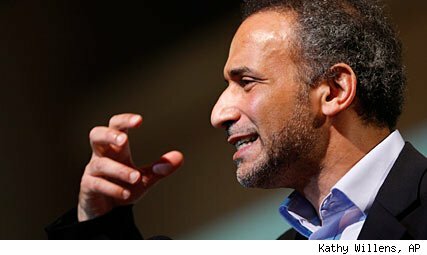 Muslim Scholar Tariq Ramadan: Radical or Reformer? On a recent afternoon, Tariq Ramadan, the outspoken Muslim scholar and professor of contemporary Islamic studies at Oxford University, took the stage at Georgetown University’s Gaston Hall. Ramadan stood alongside John Esposito, professor of international affairs and Islamic studies at Georgetown, holding court on “radical reform” in Islam and parrying with a warm, supportive audience. The room was filled with students and others, including women in headscarves, women with bare heads, journalists and professors. Such a gathering might sound relatively unremarkable for the nation’s capital, except for this: Tariq Ramadan was banned from the United States for six years, a visa restriction lifted in January by Secretary of State Hillary Clinton. That’s because Ramadan, whose name is as often mentioned with the word “radical” as with “reformer,” had become a lightening rod, a discussion point for post-9/11 restrictions on travel, ideas and the place of Islam in democracies. 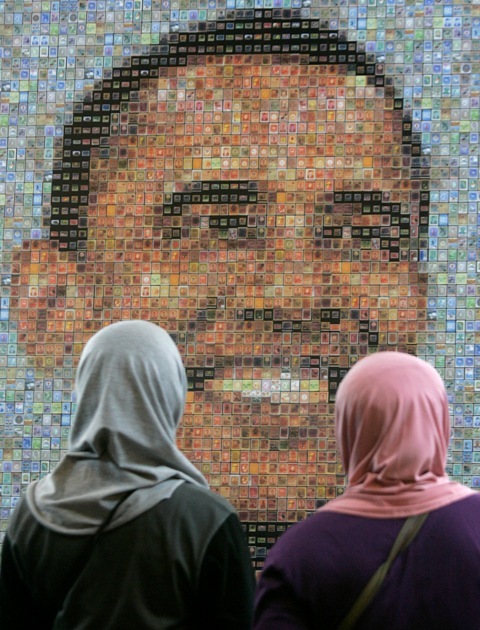 Less than a year ago, US President Barack Obama raised hope among the world’s Muslims, who had felt wronged and bullied under the outgoing Bush administration, when he stood in Cairo University and declared his respect for Muslim religion and culture. Yet, almost a year to the day later and also at Cairo University, the US-based Gallup research organisation has revealed that Islam elicits the most negative views of all other faiths among US citizens. In a survey entitled “Religious Perceptions in America with an In-Depth Analysis of US Attitudes towards Muslims and Islam”, Gallup examined Americans’ self-reported opinions and levels of prejudice towards followers of the world’s four major religions, Buddhism, Christianity, Islam and Judaism, with a special focus on Islam. The vast majority of people in many sub-Saharan African nations are deeply committed to the practices and major tenets of one or the other of the world’s two largest religions, Christianity and Islam. Large majorities say they belong to one of these faiths, and, in sharp contrast with Europe and the United States, very few people are religiously unaffiliated. Despite the dominance of Christianity and Islam, traditional African religious beliefs and practices have not disappeared. Rather, they coexist with Islam and Christianity. 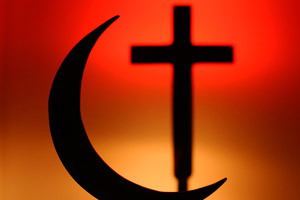 Whether or not this entails some theological tension, it is a reality in people’s lives: Large numbers of Africans actively participate in Christianity or Islam yet also believe in witchcraft, evil spirits, sacrifices to ancestors, traditional religious healers, reincarnation and other elements of traditional African religions.